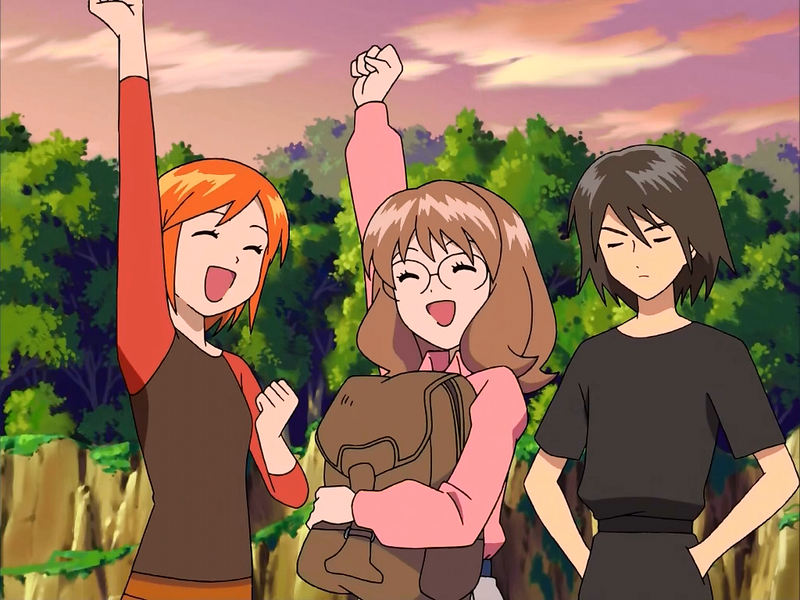 This January, at the recommendation of a group of friends, I watched all 52 episodes of Uninhabited Planet Survive (also known as Mujin Wakusei Survive), an older anime from 2003. The only English subtitles I found available are adequate at best - very literal and at times grammatically incorrect - but it still turned out to quickly become one of my favorite anime of all time despite the poor translation. I admit I'm going to be a little biased here. In the middle of a terrible winter and a battle with depression that had been going on for nearly a year, I watched the show when it was exactly what I needed, and without those circumstances my experience with the show may have turned out very different. For me, Uninhabited Planet Survive is an amazing show with an important message for its audience, and that message means a great deal to me. But for viewers watching the show under different circumstances, their enjoyment of it may depend on whether they are looking for a kids' show, or something more adult. Uninhabited Planet Survive would have fit perfectly as a traditional American cartoon. There is absolutely nothing I can think of that would have needed to be cut to make it appropriate for Saturday morning cartoon time aside from possibly a few scenes here and there with a little blood. While some wounds were actually somewhat serious, at other times it got somewhat comically overdramatic. Oh no, my shoulder got grazed! We've got to make me fall down in slow motion because this is like really serious, guys! It's not always that overdone though - this was just the most extreme case. If you're looking for fanservice, you also won't find it here, which for me was a nice change of pace. This was one of the most tame anime series I have ever watched in every way imaginable, and you know what? I was OK with that. You don't need to push any boundaries in order to tell a story. While the show is aimed at young kids, even if you're an adult viewer there is enough going on in each episode to keep things interesting. But what really struck a chord with me personally, was the premise. In the opening scene of Uninhabited Survive, a father rushes through a burning facility on Mars in order to get his young daughter to safety. Gravely injured and with no time left to save himself, he places her in an escape pod and sends her off with these parting words, "Luna, no matter how painful or difficult life may be, you mustn't give up. Live, and see everything through to the end." These words set the stage for the overall theme of Uninhabited Planet Survive, and are words that I've taken to heart in the months since I watched the show. Uninhabited Planet Survive stars a group of 7 young teenagers. As their class heads off on a school trip designed to teach them the ropes of planetary settlement, their ship is hit by a gravity storm (it's basically a wormhole) and their group's shuttle detaches from the main ship, sending them hurtling to unknown reaches of space where they crash-land on an uninhabited planet. There, they get a much larger lesson in planetary settlement and survival than they were prepared for. Uninhabited Planet Survive starts out somewhat like a slice of life show as the group secures what they need to survive - food, water, shelter, etc. A few action segments are sprinkled in as they fend off various wildlife or other dangers, but these action scenes are not the main focus. The focus instead is the interactions of the show's characters as they struggle to adjust to their situation and work together to survive. There is some drama and a fair amount of humor involved, and when things get tough, it all comes off rather heartwarming in the end, with characters that may fight amongst themselves but deep down they mostly do so only out of concern for one another. While I usually enjoy shows that are far more action-oriented, it was actually this initial slow pace that drew me into Uninhabited Planet Survive. Watching the show gave me time to relax amidst days that otherwise consisted of constant and extremely high stress, and nothing calmed me down and helped me just relax and enjoy the show better than the its opening theme, "Bokura no Message" by Kiroro. About midway through the first 30 episodes, the group begins to discover evidence that there's far more to this planet than they originally thought. Signs of other intelligent life on the planet begin to emerge as they find remnants of an advanced civilization, and with this the show slowly shifts from slice of life to an action adventure. While those that enjoy more peaceful shows might be disappointed by this shift, it is a necessary one as the balance of their previously peaceful life on the planet is upset, and investigating the planet as they look for a way home becomes more and more dangerous. Every character of the main cast has their own personality and their own role to play within the story. While this effectively means some if not all of them fall within some cliche character archetypes, it also gives each character their own strengths, as well as weaknesses to overcome. In some episodes scattered throughout the series, Uninhabited Planet Survive gives us a glance into each one of the show's 7 main characters, providing flashbacks into the events of their lives that have shaped them into who they are. These events of the past are things they have to overcome or accept about themselves, either on their own or with the help of others in the group. Of all the characters, Luna easily stands out as the show's main protagonist. She may be haunted on occasion by the death of her father, but her kind and caring nature make her the most memorable. She's the driving force that keeps the group together, with her motherly attitude and ceaseless supply of encouraging words. The source of many of the show's most heartwarming moments, she never stops believing in every person in the group, even in the moments when they stop believing in themselves. It's her words in these moments that have stuck with me the most in the past several months. A conduit for the show's theme and message, she always remains positive and hopeful regardless of the troubles they face. Also of note for nearly opposite reasons is Howard. The spoiled rich kid of the group, this is the character I absolutely hated. Not only is he directly responsible for having hit the button that detached their shuttle and got them trapped on the planet, but his self-centered behavior is a constant hindrance and jeopardizes their safety. He's also a huge coward, and while his cowardice is often played up for comic relief, most of the time I just wanted someone to slap him. Thankfully about halfway through the show, Howard finally snaps out of it, and the events surrounding that made me re-watch a lot of the scenes that made me hate him before, and I no longer did. Instead I honestly felt sorry for him. If there were one character I wish had more development in the show, it's Sharla. While she gets her own flashback episode just like everyone else, she lacks any sort of real development. She's the most depressive of the group - the easiest to give in to despair - and while she does get somewhat less prone to despairing as time goes on, she pretty much stays that way through the whole show. There are times that it is clear that Sharla's trying her hardest to be strong and to be helpful because she's tired of seeing herself as a burden on the others, and in these moments, goes as far as to put their health and well-being before her own. But once those scenes are over, she reverts to being her old self. While I did like the art style in Uninhabited Planet Survive, it sometimes looked somewhat off - aside from the colorful backgrounds, the shading of characters and objects can look flat, and when not in motion some frames can look a little odd. It does get the job done though, and I liked that each character looked very distinct from one another, from the clothes that they wore all the way down to their skin tone. A character who was clearly of Japanese descent actually looked properly Asian instead of white. Every character always wears their one individual outfit through the whole thing, but it was actually somewhat realistic as they only have the clothes that they were wearing when they crash-landed on the planet. And here's where I have to put a spoiler warning. If you don't want some of the show's plot spoiled for you, then you might want to skip this section! At some point in the show, Luna suddenly finds she has telepathic powers when she starts hearing an unknown voice call out to her. While it is later explained that these powers come from nanomachines within her body, and that she can communicate telepathically with other beings that have nanomachines, it is never explained how she came to have nanomachines in her body. The first time her powers start to manifest is the moment she falls into a lake in an early episode, but she's not the only one to have touched the waters of that lake either. So if it were from the lake, everyone should have these powers. Furthermore, by the end of the show, two more characters of the seven are confirmed to have nanomachines in their bodies for reasons that are explained, yet one would assume that gives them telepathic powers as well, but they never use them even in a situation where help could have arrived sooner if they had. While the plot of Uninhabited Planet Survive is fairly simple and straightforward, it was a 52 episode journey I may never forget. I marathoned the show and finished watching the whole thing in merely a week and a half. I just couldn't stop watching, because I always wanted to find out what happened next. I felt connected with that group of 7 kids - I didn't want to part with them. But alas, all good things must come to an end, and on episode 52, it wrapped up the last of the loose ends and came to a proper, satisfying conclusion. Uninhabited Planet Survive is a hidden gem that I think a lot of people missed when it originally aired in Japan. It's never seen a western release physically or digitally, and I had honestly never heard of the show until my friends mentioned it. If reading this has made you curious about the series, I encourage you to give it a shot. If you're at a point where you feel like life is an endless struggle, it might even be just the show you need to watch.